Alyn garage doors, a true framed, ledged & braced garage door. A true framed, ledged and braced garage door (otherwise known as FLB garage doors) with a solid, full thickness head/top rail and bottom rail. Sound good? 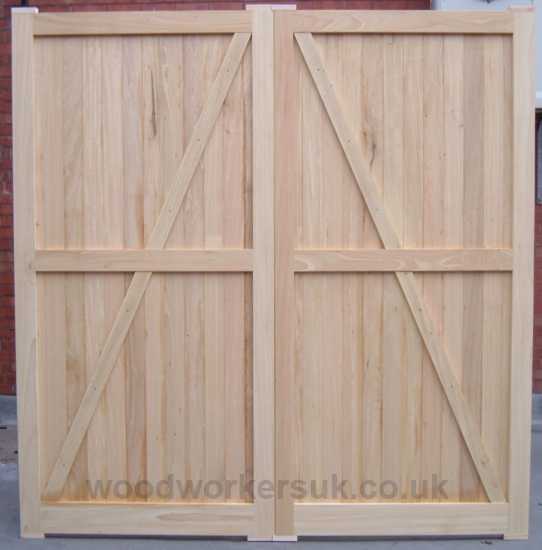 Whats more they are all made to measure and based on a through, wedged morticed and tenon jointed frame ensuring that they not only look great but are built to last. 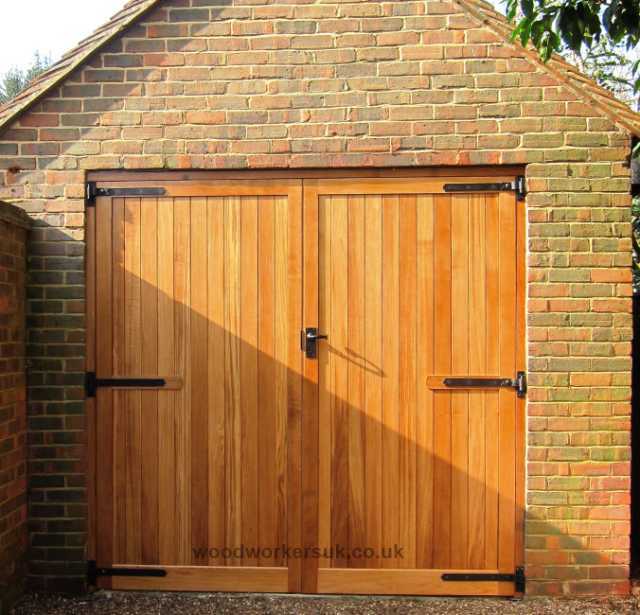 Our mid-range wooden garage doors, the Alyn side hung garage doors are available made to measure in smooth planed Scandinavian Redwood (Softwood), Accoya (Modified Softwood), European Oak, Meranti or Idigbo (hardwoods) and feature rebated centre meeting stiles. The tongue and groove boarding on the face of the Alyn doors is jointed into both the top rails/heads and bottom rail of the doors – we don’t stop there though as the boarding is also jointed into the stiles (vertical uprights) of the doors! The Alyn pictured are the usual 50/50 equally split doors (both doors the same size), however if you want one door bigger than the other then we can manufacture them for you. Want to bi-fold or slide our Alyn garage doors? If so please contact us for more information. The Alyn is a true framed ledged and braced door, if you look at the front and rear pics above you’ll notice that the boarding ends where it comes into contact with the bottom rail, and the bottom rail is at the very bottom of the door. These days you’ll find a lot of people trying to pass off ‘framed, ledged and braced doors’ that do not have a full thickness bottom rail (they have a hidden or barefaced bottom rail which can only be seen from the rear of the door) as can be seen on the centre rail in the Alyn doors above – these are not true framed ledged and braced doors (FLB). If you’re looking for a door without a solid bottom rail then check out our Clwyd garage doors still based on a through, wedged morticed and tenon jointed frame! If you do choose a true framed, ledged and braced door then the other thing to check is the proportions of the bottom rail in comparison to the top rail or head – the bottom rail is always bigger! As with the Alyn above, the bottom rail is 5 3/4″ / 145mm while the top rail is 3 3/4″ / 95mm. The Reason for this is tried and tested over the years, the door would not look right with a 3 3/4″ high bottom rail and if you decided to match the top rail with the dimensions of the bottom rails (145mm) then again the doors look out of proportion! So why a solid bottom rail? The solid bottom rail gives the doors additional strength that is especially needed on wider doors. It also provides the added benefit of protecting the more vulnerable end grain of the tongue and groove boards (end grain can be difficult to protect adequately with paints or stains as it gets absorbed rather quickly and doesn’t last as long! ), with a solid bottom rail the boarding of the doors is approx 5 3/4 inches (145mm) high up from the ground meaning that the boards cannot soak up any lying water. Bottom rails – 5 3/4″ x 1 3/4″ / 145mm x 45mmRebated meeting stiles (the doors overlap when closed). The Alyn guide prices are based on a pair of doors 6ft 6 high x 6ft 6 overall wide (approx 1980mm high x 1980mm), these are NOT from prices, smaller doors will be more economical etc – contact us for a price! All prices are correct time of insertion and are EX VAT. Free delivery to most parts of the UK mainland is included – exclusions do apply, again please contact us. To get a personalised costing on our Alyn framed ledged & braced garage doors please use the form below.